“Grace and truth came through Jesus Christ” (St. John 1:17). Christmas is about Jesus Christ. That is as it should be. The faith of Christians is to be centered on Jesus Christ. The whole mission of God’s Church in the world comes from Jesus Christ. The message the Lord’s people speak to each other and to their neighbours means very little if it does not point in clear words to Jesus Christ. Someone has said that you can find three accounts of Christmas in the Gospel books of our New Testament. Matthew tells the story by focusing on the way it was all experienced by Jesus’ earthly father, Joseph the carpenter (Matthew 1:18-25). Luke, meanwhile, describes the same wondrous event from the point of view of the Lord’s mother, Mary the virgin (Luke 1:26-28; 2:19). Third, you get a glimpse of it all from God’s side in John 1:1-18. To be sure, this way of labelling the various Christmas stories may seem a little too simple, but it can help fix them better in your memory. There are themes frequently noised around these days to describe what the church’s faith and work are all about: love, peace, justice, inclusivity, diversity, and on it goes. Such themes have their place. You find them mentioned and unpacked in the Bible. But things always go off the mark when these ideas somehow become a program or a goal on their own and do not bring you back in a targeted way to Jesus (John 5:39; Colossians 1:17). 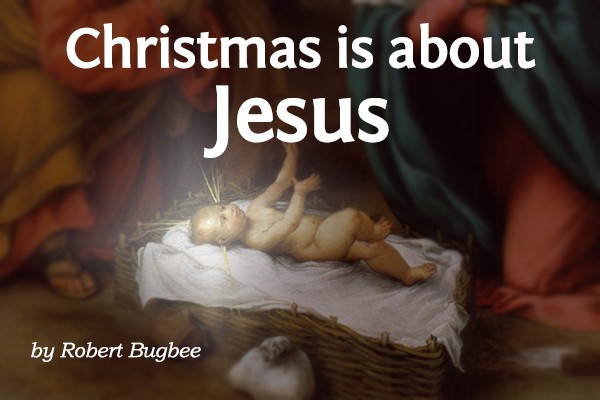 “Grace and truth came through Jesus Christ,” you read in that third Christmas story (John 1:17). Grace and truth are beautiful themes, too. But you will never find them and never come to know what they are apart from the One who brings them to you. Grace and truth have to come from Him, or they do not come to you at all. Jesus Christ not only spoke truth in His preaching and teaching. Everything He did—and let others do to Him—tells you the truth about yourself and your deepest need. Grace and truth are beautiful themes, but you will never find them and never come to know what they are apart from the One who brings them to you. Grace and truth have to come from Him, or they do not come to you at all. The truth is that you and I are like sheep who wandered off on our own and cannot find our way back again. The truth is that whatever good you have been able to do—no matter how much it impresses you or others—never erases the sins and failures of your life. The truth is that God is holy; He does not turn a blind eye to the ways we have trampled His will, grieved Him badly, and hurt other people along the way. The truth is that the treasures most people crave—success at work, popularity in the eyes of others, houses, holiday trips, fun pastimes—all come to an end. The truth is that you cannot meet your deepest need on your own. Above all, you need mercy. Everything Jesus did in the past and everything He gives us now in the words we have in the Scriptures make that truth clear, if you have the heart and ears to let Him bring it to you. “Grace and truth came through Jesus Christ,” writes St. John. The Child adored by shepherds and angels did not come down only to unload on you the painful truth about yourself and the fallen world, and then to leave you hopeless. He brings with Him the bought-and-paid-for love of God. This is not some soft weakness that says ‘Yes’ to everything, but instead a pardon that faces up to the full truth of your wrongs, a pardon purchased and won by the life Jesus Christ lived and the death He died in your place. Grace (that is, undeserved love) does not come because God decided His laws didn’t matter. It doesn’t come because, “you’re only human; the Lord can see that, and He hasn’t got the nerve to condemn anybody.” No, grace comes because God knows you and I need it. Grace comes because Jesus was born, lived, died and was raised again to bring it to you. Grace comes because Jesus comes. That’s the wonder you are privileged to celebrate once again this Christmas. Grace does not come because God decided His laws didn’t matter…. It comes because God knows you and I need it. Grace comes because Jesus was born, lived, died and was raised again to bring it to you. Grace comes because Jesus comes. May God bless our pastors at this time of the year to speak the Christmas Good News saturated with the Name of Jesus Christ. May He give you a Christmas season where Jesus Christ stands at the centre of your thinking and celebrating. May He make your church into a place known in the neighbourhood as a glad lighthouse where Jesus Christ is preached and brought near to anyone willing to listen. Christmas is about Jesus Christ. That is as it should be. Rev. Dr. Robert Bugbee is President of Lutheran Church–Canada.